With baseball season in full swing, walleye anglers should warm up their pitching arms and get ready to rip. To catch the most early-season ‘eyes, rest your kicker motor and work out a Rapala Rippin’ Rap, casting it to shallow rock piles, sand flats and break lines, rather than trolling over them. 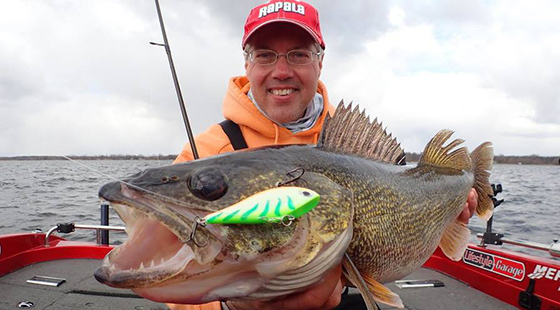 Casting Rippin’ Raps for shallow walleyes works best when water temps are in the 50- to 55-degree range. To get the most bites, make long casts to structure and during your retrieve repeatedly rip the lure up off the bottom and then quickly drop your rod tip to allow the bait to free fall on a slack line. “Nine times out of 10, those fish are going to hit the bait on the fall,” Roach says. 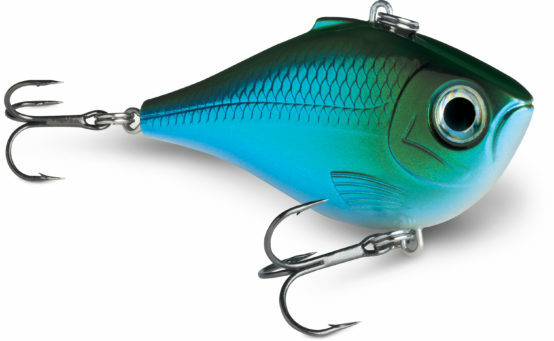 Featuring flat, skinny sides and a deep-belly profile, Rippin’ Rap lipless crankbaits flutter-drop on a slack line and pop off the bottom with a hard-vibrating action accented by a loud, distinctive rattle system. Textured scales, gills with deep-set 3D holographic eyes and fast-piercing VMC black-nickel hooks seal the deal. Another good way to catch early-season walleyes on Rippin’ Raps is to swim them over and through the tops of new vegetation. With your boat in deeper water, fancast across spawning flats, making contact with the submerged vegetation. If the grass that comes back on your treble hooks is brown and dead, keep covering water. When green grass comes back on your hooks, slow down and pick apart the area. More often than not, that’s where you’ll find the fish. When your Rippin’ Rap hits grass on the retrieve, pop it free to trigger bites. Actually, I prefer to hold my rod up after ripping, allowing the bait to fall on a semi-taut line rather than slack line. I lower my rod while reeling up the slack after the bait hits bottom. Was on Green Bay last week rip jigging raps, 30 fish over 24″ what an awesome Bait!